For one glorious season (2003-04), the NHL had a Vintage Jersey Program. It was a small program (only the Bruins, Oilers, Kings, Canadiens, Rangers, Blues, and Canucks took part), and it had its flaws (some teams didn't bother with matching equipment), but it had the potential to be something great. Unfortunately, the following season was lost to the 2004-05 lockout, and the Vintage Jersey Program wasn't brought back afterwards. It would be introduced for the 2019-20 season, as third jerseys are being re-introduced this upcoming season. Participation wouldn't be mandatory. I'm picturing about 20 teams taking part. Each vintage set would consist of a matching (from the same year) light and dark jersey. The vintage jerseys would be worn about six times total (three each for the light and dark jersey). 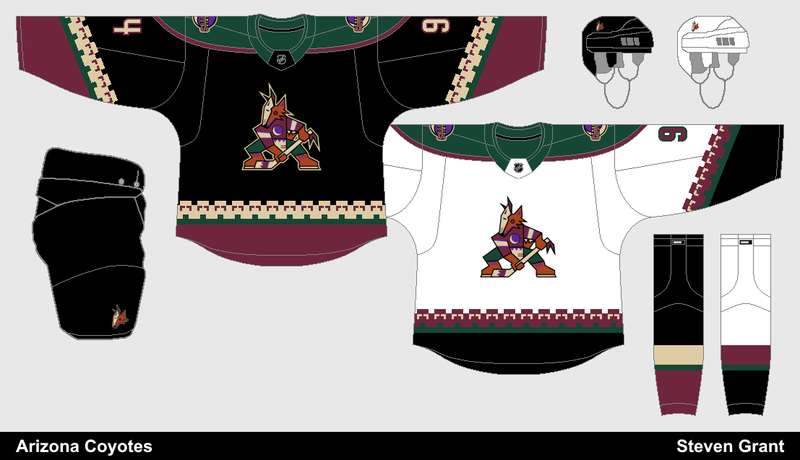 When vintage jerseys are worn, both the home and road team would be in their vintage jerseys (as much as possible). A jersey could be both a vintage jersey and a third jersey. 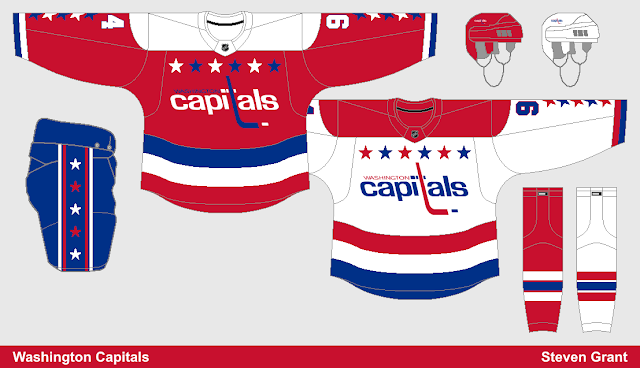 For example, the Capitals could use their throwback red jersey as a regular third, while also using it as their dark vintage jersey (along with the matching white jersey). Teams wouldn't be able to switch to a different vintage set for a certain amount of years (about three to four years). This would prevent teams from rotating vintage sets each year solely for jersey sale reasons. During that time limit, teams could still scrap their vintage jerseys, or promote them (to become their primary jerseys, or a third). 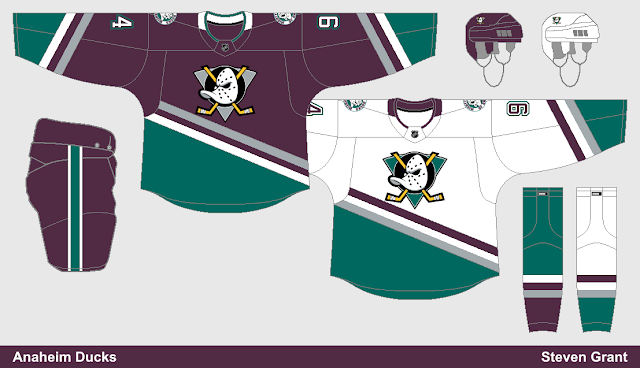 The original eggplant and jade set is really the only option for the Ducks. Likewise, the Coyotes have an obvious choice with their old Kachina-style jerseys. 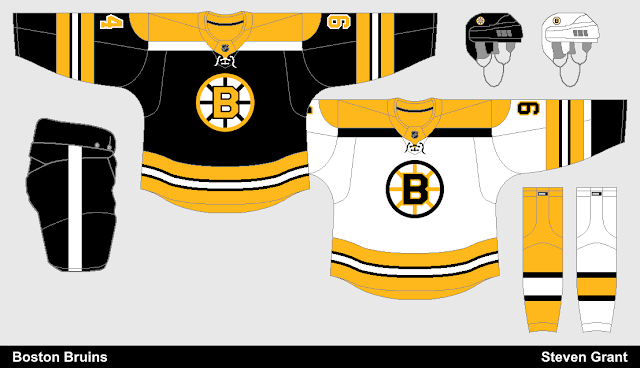 The Bruins have a lot of classic jerseys, but my pick would be their cup winning jerseys worn from 1967-74. 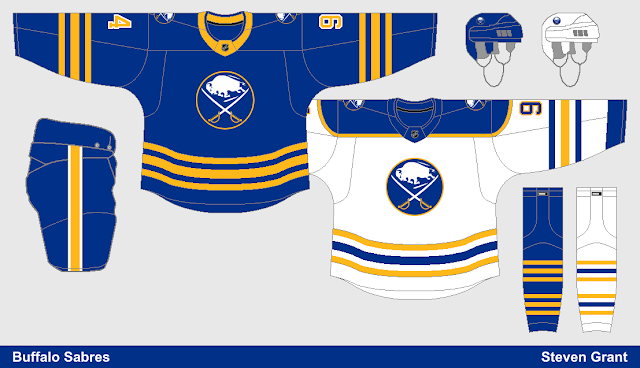 Bringing back their royal blue set would be in order for the Sabres, hopefully followed by a promotion (to become their home and road set) soon after. 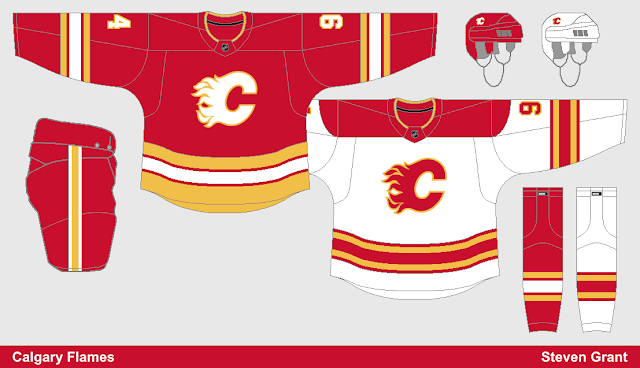 The Flames won a cup during their red and yellow (without black) era, I can't see why they wouldn't want to bring these back. 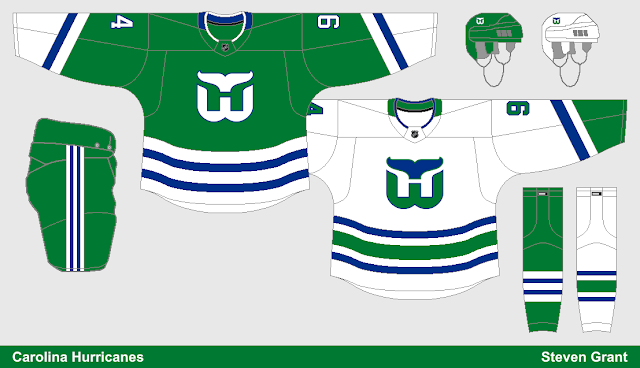 Tom Dundon (the Hurricanes new owner) has already brought up the idea of wearing throwback Whalers jerseys for a few select games. The Blackhawks are one of the teams I could see not participating in a Vintage Jersey Program. With all the Winter Classics they play in, they might be getting tired of wearing throwback jerseys. Colorado's current jerseys are too similar to their classic cup-winning set, and I doubt they'd bring back Nordiques jerseys, so I don't think they'd take part either. 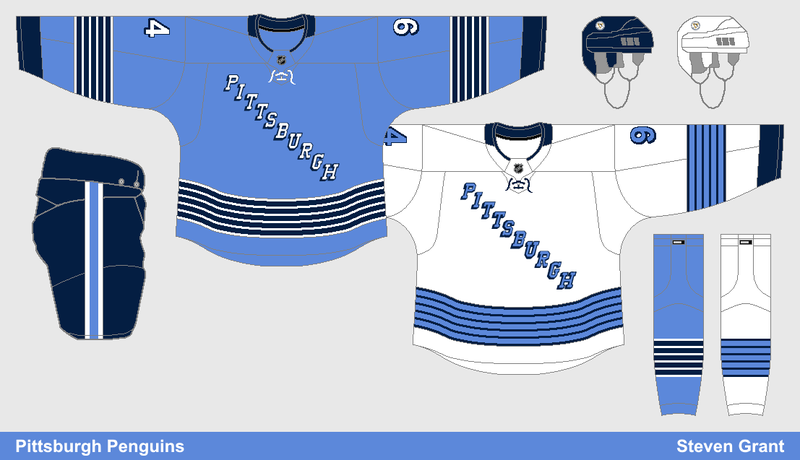 The Blue Jackets could bring back their original jerseys as vintage jerseys, however that doesn't seem very likely to me. Dallas' 90's jerseys aren't really seen as classics, but I'm guessing the Stars would still choose to bring them back. The Red Wings haven't changed their look much over the years, and they are a traditional franchise. I think vintage jerseys would be too gimmicky for them. 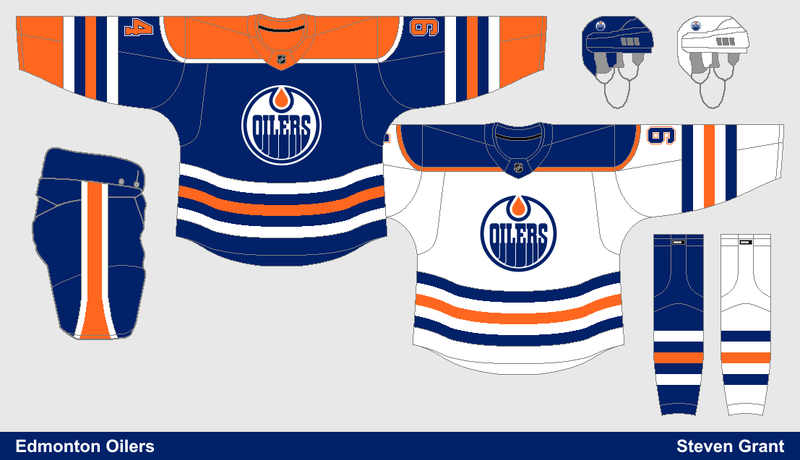 Now that the Oilers wear orange full-time, the path is clear for them to bring back their dynasty-era jerseys as a vintage set. 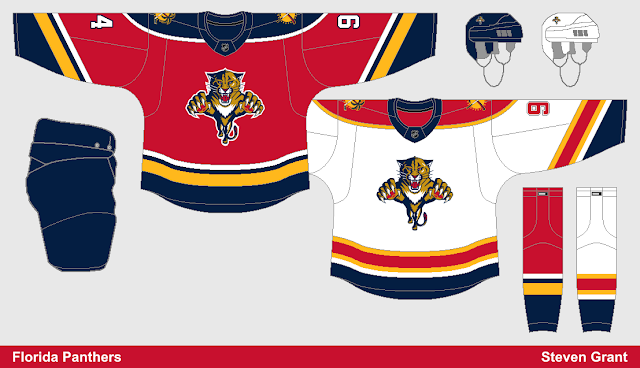 Why wouldn't the Panthers want to bring back their original jerseys for a few games a year? I can't think of any reason why they wouldn't. 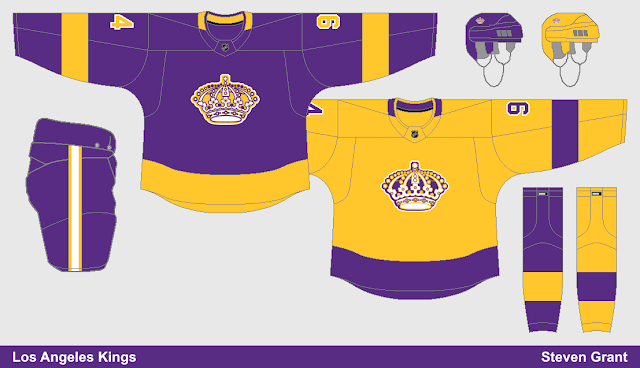 The Kings have brought back (in separate seasons) both the purple and gold versions of their original design, I'm guessing those would be their choice here. I don't think it's time for the Wild to bring back their original jerseys yet. The Canadiens could bring back their 1944-47 set as they did for the original Vintage Jersey Program, but I see them choosing not to participate this time. I would love to see the Predators original jerseys make the occasional appearance, but I think Nashville has moved on with their current yellow-infused set. 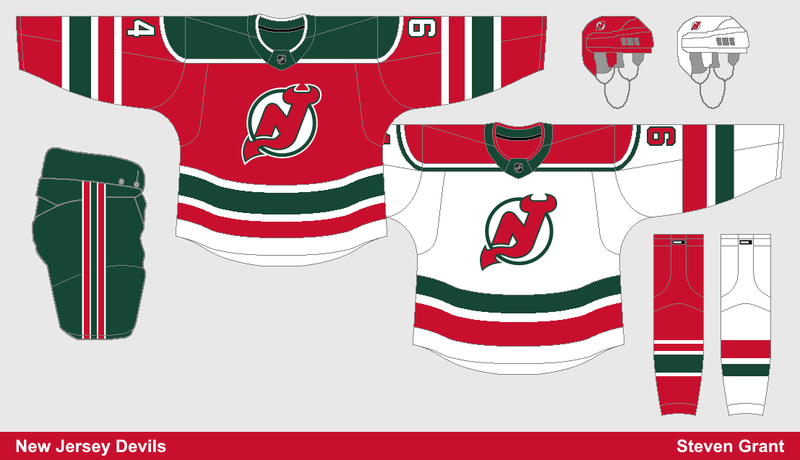 The Devils' vintage red jersey seems to be popular whenever they break it out, I'm sure the white jersey would be as well. The Islanders are already wearing a throwback set as their primary jerseys, so it doesn't make sense for them to take part in a Vintage Jersey Program. They participated in the original Vintage Jersey Program, but I don't think the Rangers would bring back their 1976-78 set again, and their other options are all quite similar to their current jerseys. 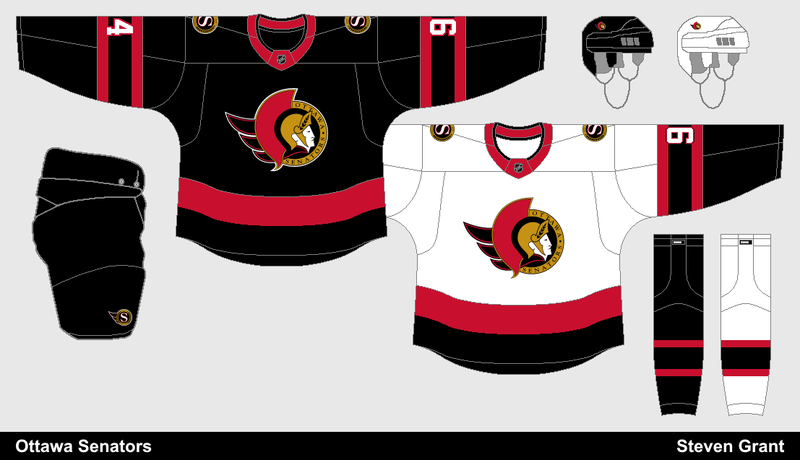 I'm guessing the Senators would break out their original jerseys. 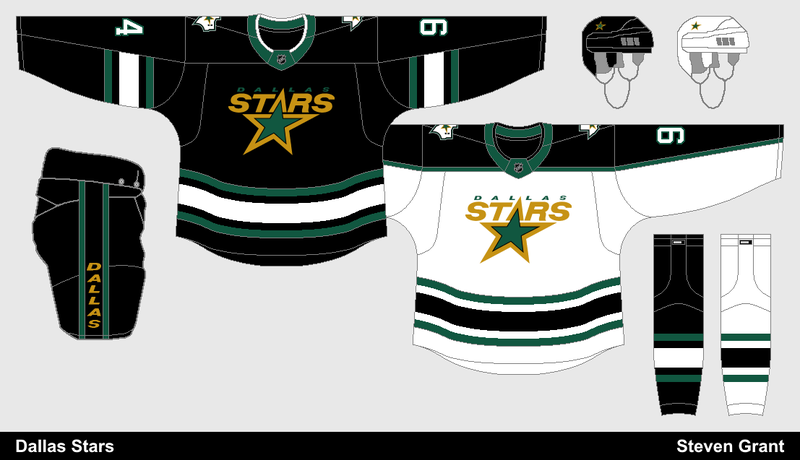 I went with the 1993-95 variation (black jersey has white numbers, but no white in the stripes). Since the Flyers are already using vintage primary jerseys, I can't see them being a part of this program. The Penguins are back in their classic cup winning set, but they have lots of other options from before then, including their inaugural jerseys. During the original Vintage Jersey Program the Blues went with their 1979-84 set. I think they'd go in the same direction this time around. 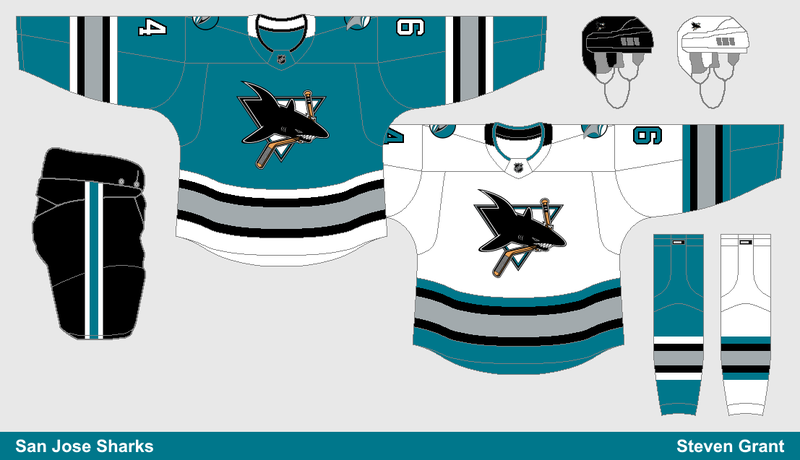 If the Sharks were to take part (which I think they would), they'd go back to their original jersey design. The Lightning also have an easy choice with their original set, but the question is which version? I went with the 1995-2001 option (Hawaiian blue and paint brush numbers). There are quite a few options for the Maple Leafs to choose from. I decided on their Ballard-era jerseys (1970-92), since they're the least similar to their current jerseys. The most fun option for the Canucks would be their "Flying-V" jerseys, but a more realistic option would be their 1990's skate-on-a-plate set. The Vegas Golden Knights have no vintage jerseys, so they obviously wouldn't be participating. The Capitals would surely take part though, resurrecting their classic 1974-95 jerseys once again. Winnipeg is a bit tricky since the original Jets now reside in Arizona. The easiest solution would be for the Jets not to participate (but that wouldn't be a popular decision). What do you think, should the NHL bring back the Vintage Jersey Program? And if so, what jerseys would you like to see brought back? Nice post, I think they should bring them back. If the Canucks, Pens, and the Kings have their collars filled I would buy it in a heart beat. 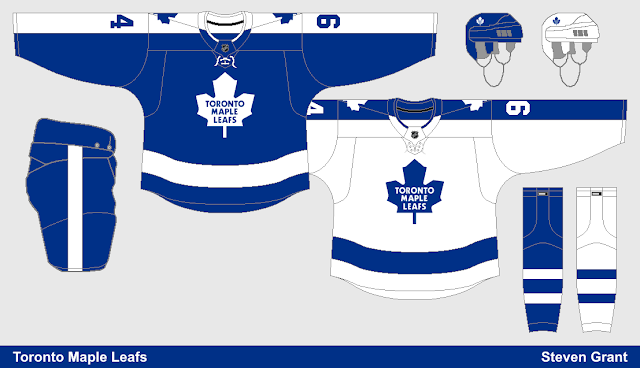 The Maple Leafs set fits the Adidas form so well.